An NHS whistleblower has said staff morale has hit "rock bottom" at a hospital criticised by the Care Quality Commission for its "bullying culture". 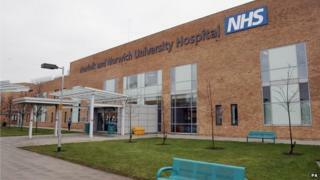 The member of staff at the Norfolk and Norwich University Hospital, who asked not to be named, said there was concern about bullying and poor communication. "On the ground floor we just feel like we're firefighting," she said. Hospital chief executive Anna Dugdale said managers were improving services and tackling bullying. The hospital worker told the BBC: "I think staff morale is at rock bottom. I believe communication is very poor. We are not really aware of what the main focus of the trust is or in what direction we're going. "I do know of staff members [in some departments] that feel there is a bully culture and staff turnover in those areas is fairly significant. "I hear staff moaning regularly and actually the time taken while they are chatting and moaning is not productive for the organisation, and sickness goes up." On Thursday the findings of an inspection report by the Care Quality Commission were announced. Its chief inspector of hospitals, Prof Sir Mike Richards, said there were some areas of good practice, but there were "serious concerns" about a "bullying culture within the leadership team". Ms Dugdale said: "Our NHS staff survey results put us in the bottom 20% nationally for bullying and harassment. "This is something we take very seriously and we have been working with staff members and staff representatives in forums and meetings to develop our action plan to address this issue."